The house, located at the intersection of Turin and Milan is the starting point for visits to Asti, Chivasso, Chieri, the treasures surrounding art, wine tours and walks in the woods between churches, votive pillars and vineyards. The apartment (m. 75) located on the first floor and consists of 2 bedrooms, kitchen, two bathrooms. Then has 4 beds, a sofa bed (cm. 130 x 180), a camp bed (cm. 120 x 60). The apartment can take advantage of a terrace to have meals and from which you can see, on clear days, the mountains and observe the flight of birds and often buzzards. - A hairdryer and an iron are available. - There is a high chair for the little ones and a camping cot. Behind the house is a lawn where you descend into the orchard and where you can relax in the shade of the pergola of grapes; if you have children can play on the lawn on which you can enjoy the sun or organize a barbecue. 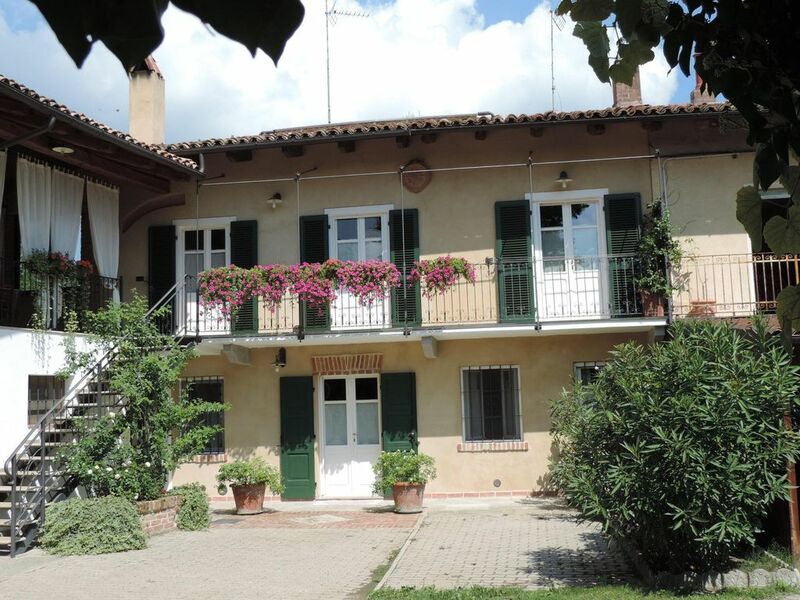 Cocconato is called the balcony of Monferrato for the beauty of its views, orange flag of the Touring has a microclimate that allows the coexistence of fir trees, araucarias and palms. Cocconato has a culinary tradition that made him famous in the world. the Via Francigena, the road traveled by European pilgrims to Rome and the Holy Land. After visiting the characteristic surroundings of Cocconato, wine shopping and visiting the Roman churches you can visit Chieri with its thousand churches, Asti with its history and the Palio with the historical re-enactment in September, Turin with its museums, its holds, and his nightlife. A journey, on foot or by bike from some identified as a variant to the Via Francigena connecting Abbey Superga with Sanctuary Create passing the Canonica Vezzolano. This road passes a few meters from our house. Those who love swimming can find a swimming pool at about 10 Km. In Boscorotondo. The bags are discharged in the courtyard where you can leave your car. We live on the ground floor and so we are always present, but housing will be independent. We ask our guests not to smoke in the house. We do not accept pets because they do not come into conflict with the neighbor's dogs. In compliance with Italian laws guests must sign a lease for the period of time the text of which will be posted for viewing at the time of booking. This does not involve any cost. We are a hobby farmer, then in summer we can, if they wish to engage guests in our activities. We do not accept animals because they do not conflict with the neighbor's dog. A lovely place to stay . Ilda and Carlo were welcoming , friendly and helpful and we had everything we needed. Cocconato is a great village with all the shops and amenities you could want. Hi Jane! I hope your trip towards home was good! Thank you for your kind words. See you again in Cocconato! Good bye! Thak you very much for your kind words. For us was a pleasure to host you and your little boy. I wish you every good thing for your life! A kiss to the boy! Un pur "Attimo di pace"
Carlo et Ilda sont des hôtes fantastiques, qui ne savent pas comment faire pour nous aider, nous conseiller. La maison est très belle et extrêmement propre, tout le nécessaire y est du linge à la cuisine équipements etc.... si vous souhaitez recharger les batteries, au grand air en ayant en plus l'opportunitée de voir, manger, boire, visiter, milles choses tout autour, alors c'est votre prochain lieu de vacances ! Grazie Corinne e famiglia tutta! siete molto gentili! Noi siamo ovviamente contenti se i nostri ospiti apprezzano la nostra casa e la nostra disponibilità e quindi vi ringraziamo ancora. Per noi è stato un piacere conoscervi ed è stata una gioia avvicinare ragazzi come Jules e Malvin. Vi auguriamo di continuare bene le vacanze e soprattutto... buona vita a tutti! ILDA et CARLO nos hotes ont été super gentils tout en restants discrets. nous avions tout l'equipement souhaité pour le sejour. We spend two weeks in may in Cocconato and enjoy our holydays. It is a wonderful place, the flat is really fine and the interior design is loveley and individuell. Ilda and Carlo are great host and wonderful people. The location is perfect, Cocconato is within walking distance and offers everything you need. We really enjoyed the time there and like to come back! Hi Helga and Chistian! I feel well thinking that you enjoyed your holiday in Cocconato and Piedmont. I will be really glad to see you again. Thank you for your nice worlds!! Good bye! Sehr schöne Ferienwohnung in ruhiger Lage mit herrlicher Terrasse und sehr netten Gastgebern. Man kann sich sofort wohl fühlen in der sehr gut ausgestatteten und absolut sauberen Wohnung. Die Terrasse ist durch die Überdachung gut geschützt und man kann sie sehr gut nutzen. Ilda und Carlo sind sehr freundlich und hilfsbereit und geben Ratschläge für Ausflüge und Unternehmungen. Cocconato ist ein netter Ort, wo man alles bekommt und das frische Obst liefern Ilda und Carlo. Uns hat es dort sehr gut gefallen. Although our house is surrounded by woods, we are at 800 m. from the center of Cocconato where there are supermarket, restaurants, wine being a country of gourmets. We live on the ground floor and so we are always present, but housing will be independent. Obviously, if our basic knowledge of French, English, Portuguese ce permitting, we will be happy to know you better.